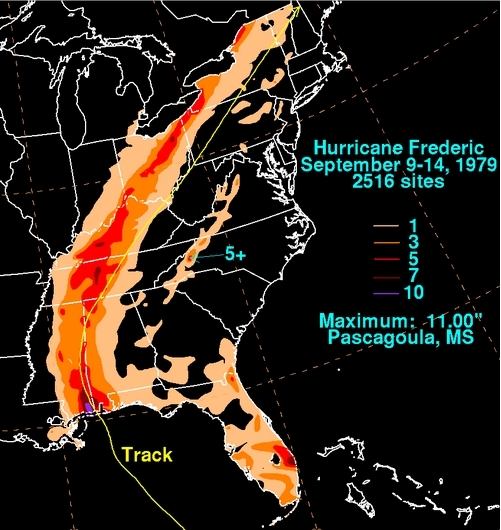 “On the evening of September 12, 1979, Hurricane Frederic crossed the west end of Dauphin Island as a Category 4 hurricane. It then traveled northward along the Alabama-Mississippi state line. Frederic was the first hurricane to directly strike Mobile County since the 1930s. It set an all-time record low pressure at Mobile’s airport. Damage costs were around $2.3 billion at the time. It still had hurricane-force winds near Meridian, Mississippi. Nearly a foot of rain fell in Jackson County, Mississippi. Mobile Bay saw up to 10 feet of storm surge while some Gulf Beaches saw up to 15 feet. A half a million people in the region evacuated and that helped to keep the death toll to around a half-dozen, directly from Frederic. Some people were without electricity in Mobile for months.